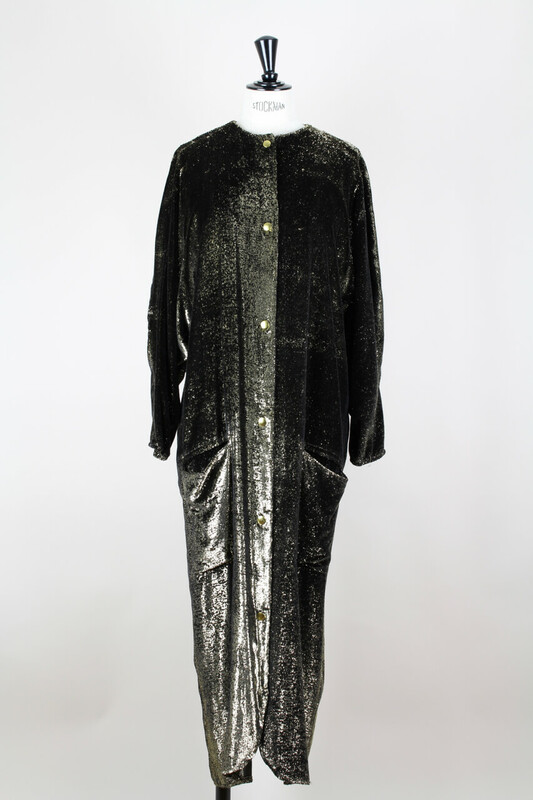 Spectacular metallic gold and black lurex velvet bustier and coat evening ensemble. 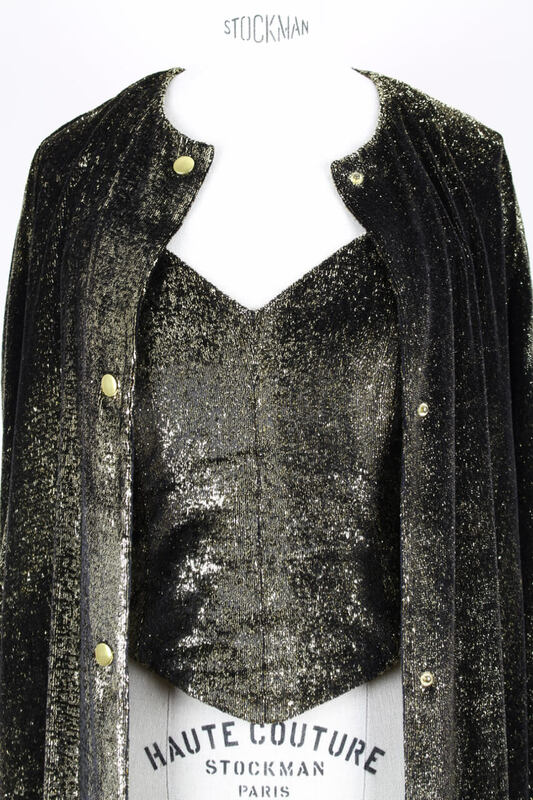 This bustier top and matching evening coat ensemble is custom-made in soft gold to black shimmering lurex velvet. 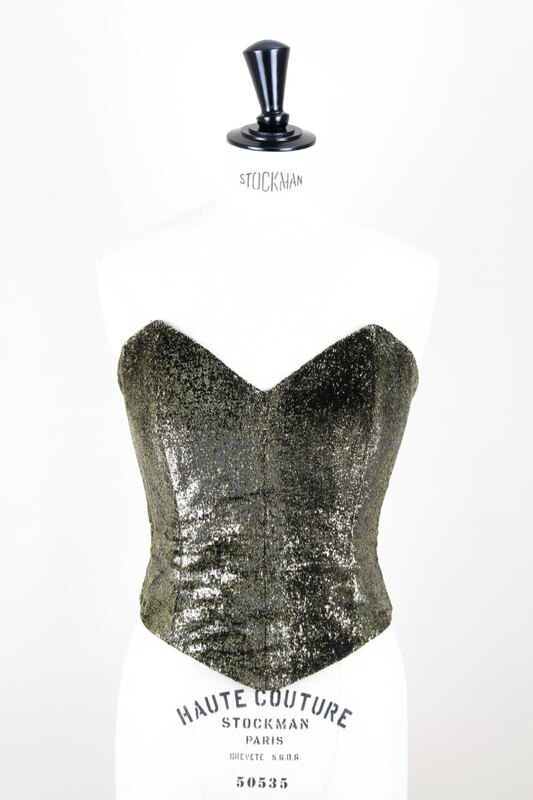 The bustier features a strapless design, a sweetheart neckline, a deep back neckline and a boned and fitted silhouette. 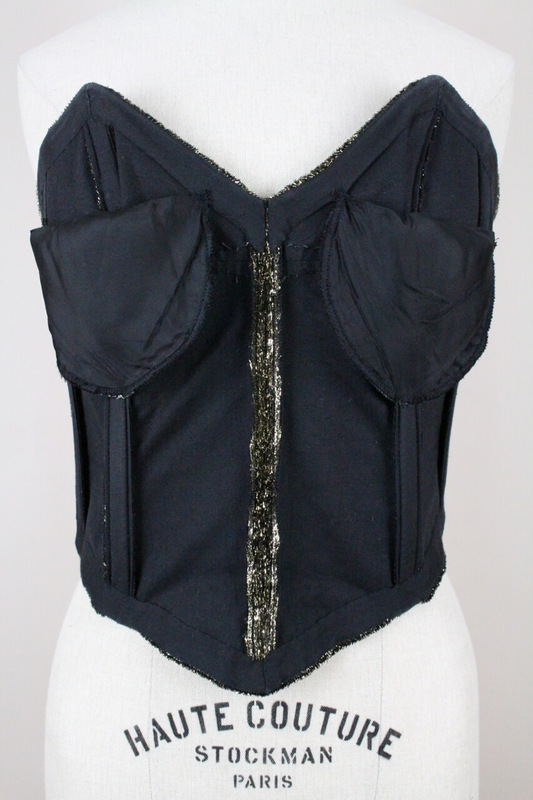 It is fully lined in black cotton fabric, comes with sewn-in bust pads and a center back concealed hook closure. 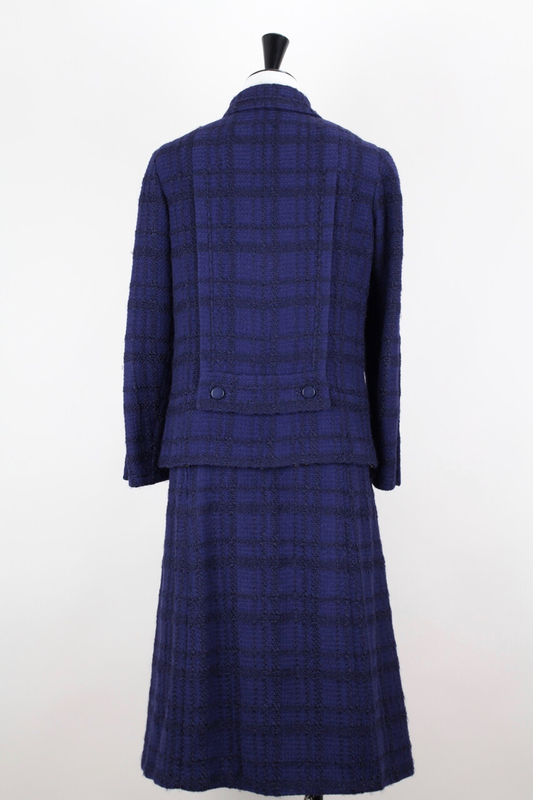 The matching three-quarter-length coat is tailored from the same fabric and features a straight cut, a crew neck, long dolman-style sleeves and two patch pockets at the front. 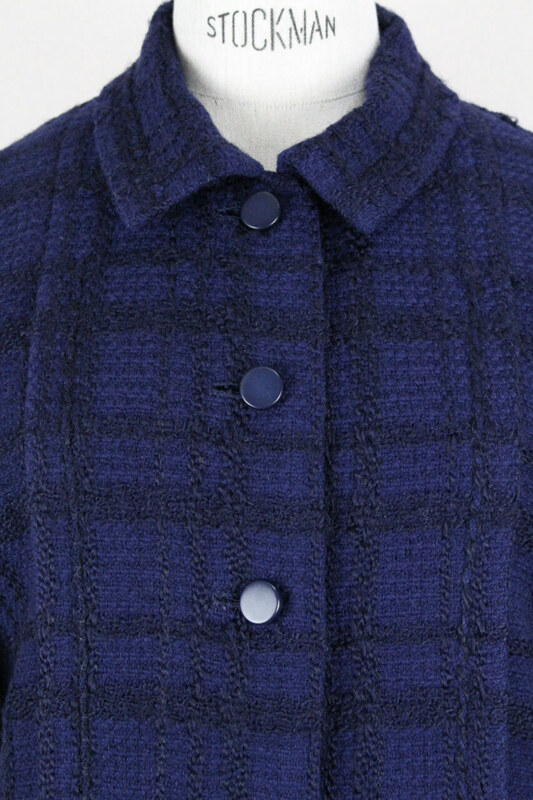 It closes with six snap buttons, is unlined and designed for a loose fit. Please note that the colouring in person is a touch more gold in feel with a drop less of black to it. 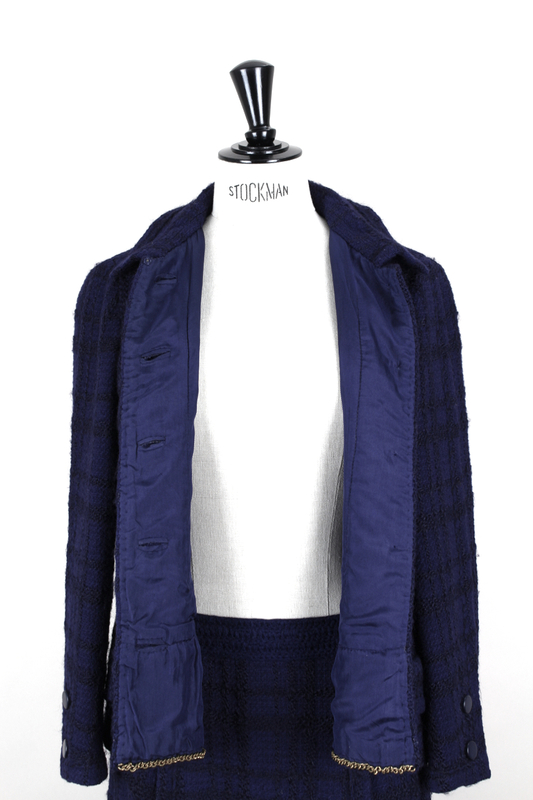 Perfect with slim black trousers for a notice-me yet sophisticated evening look! 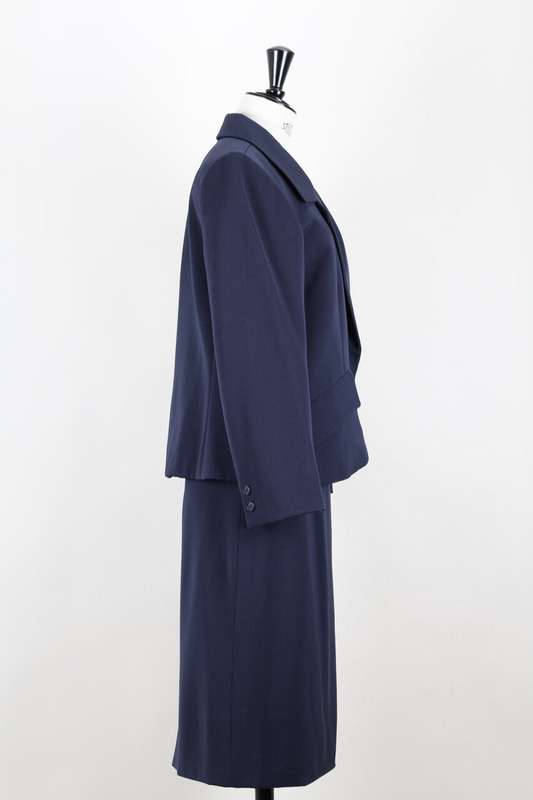 Bust: 88 cm – 34.6"
Waist: 113 cm – 44.5"
Hips: 113 cm – 44.5"
Timelessly elegant numbered Haute Couture jacket and skirt suit by Marc Bohan for Christian Dior from Spring-Summer 1989. 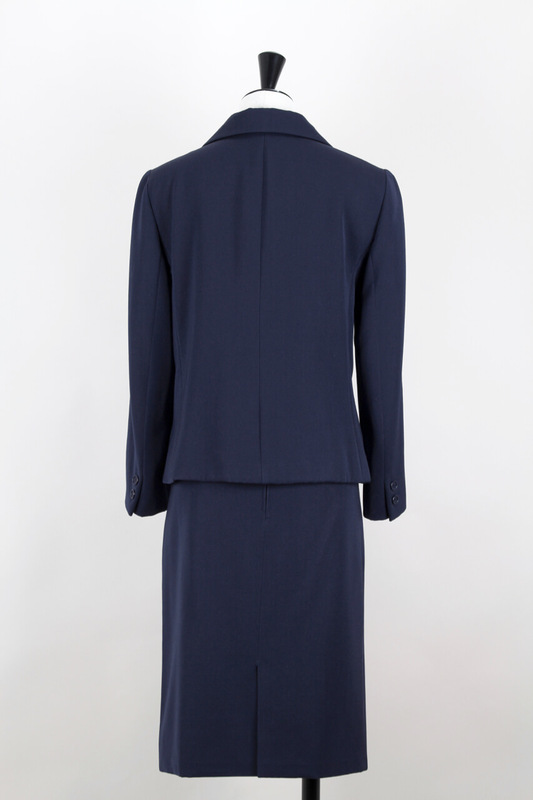 This Dior skirt suit is constructed in a high quality wool in that perfect navy blue that Christian Dior always fascinated: “Among all colours, navy blue is the only one which can ever compete with black, it has all the same qualities,” he said once. 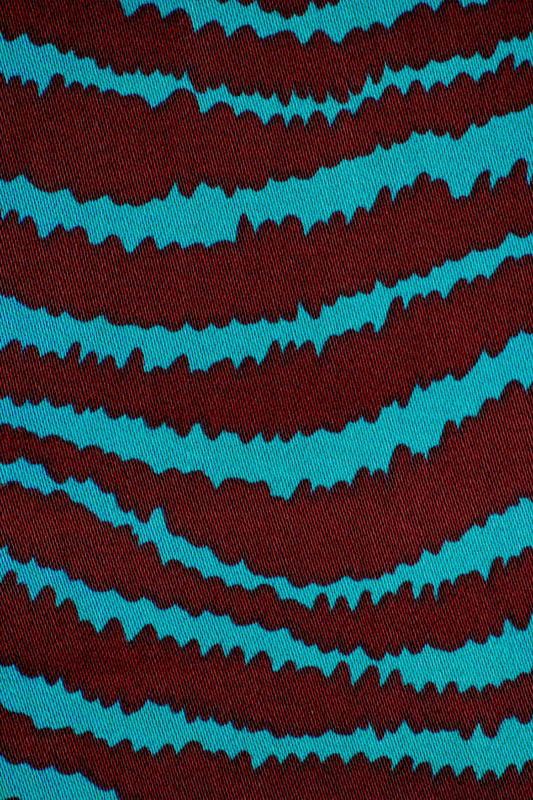 The fabric has enough weight to it to take advantage of its slightly sculptural qualities while still remaining light weight when on. 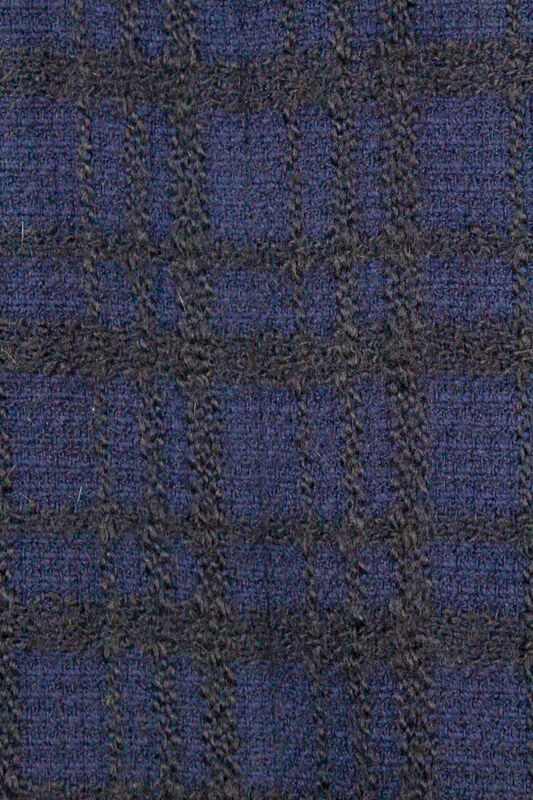 It is lined in deep blue silk. 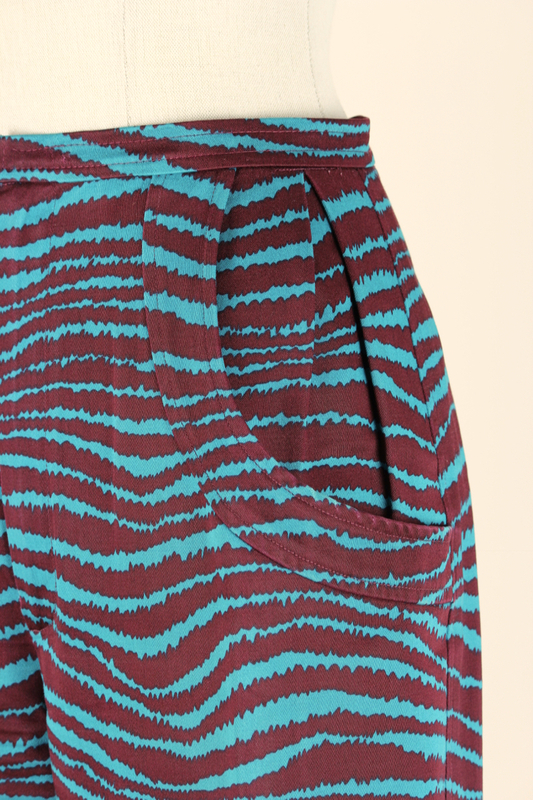 A perfect piece for the office or daytime events in a wearable size. 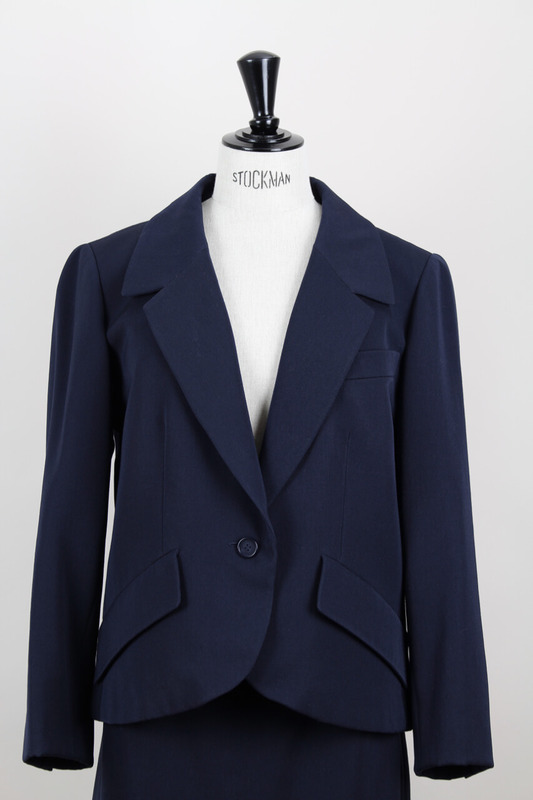 The jacket has a slightly fitted cut, notched lapels, long sleeves with a two button cuff, one breast pocket on the left side, two lower front pockets that are sculpted to diagonal design (all functional) and closes at the front. 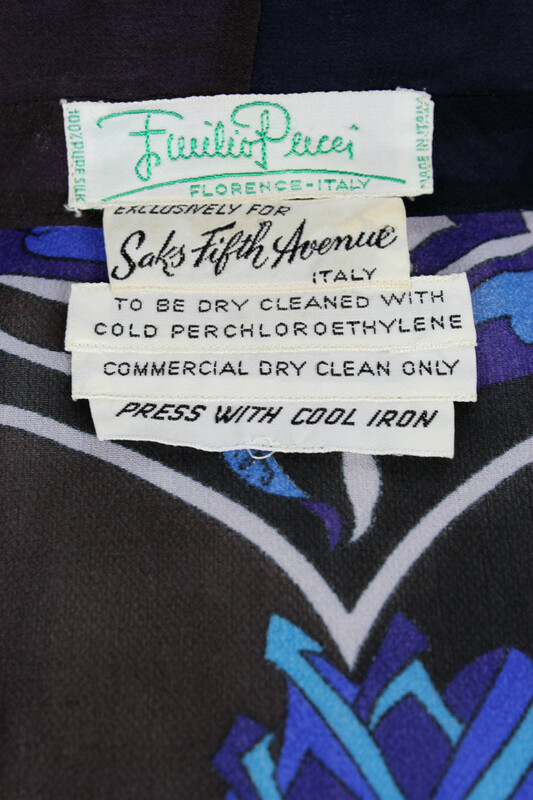 The original label has the registered couture number 25535 and the fabric tag behind. 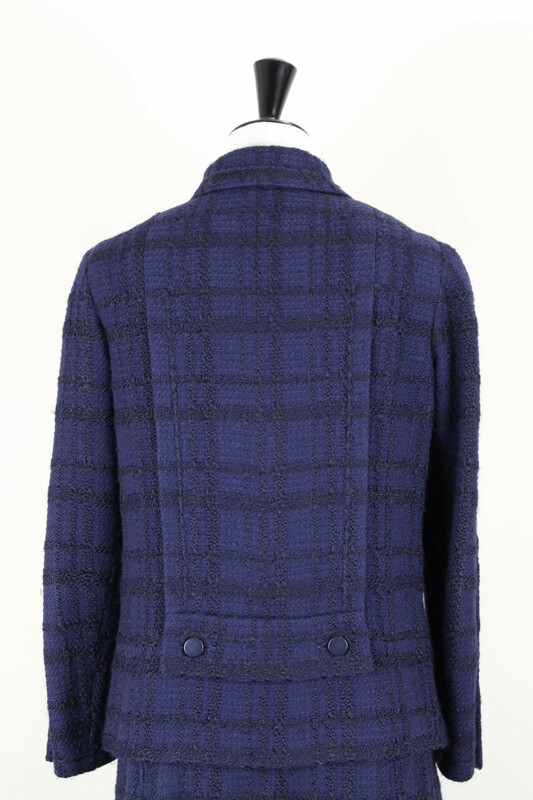 You could easily wear the jacket on its own, teamed with tailored trousers for a sleek office look. 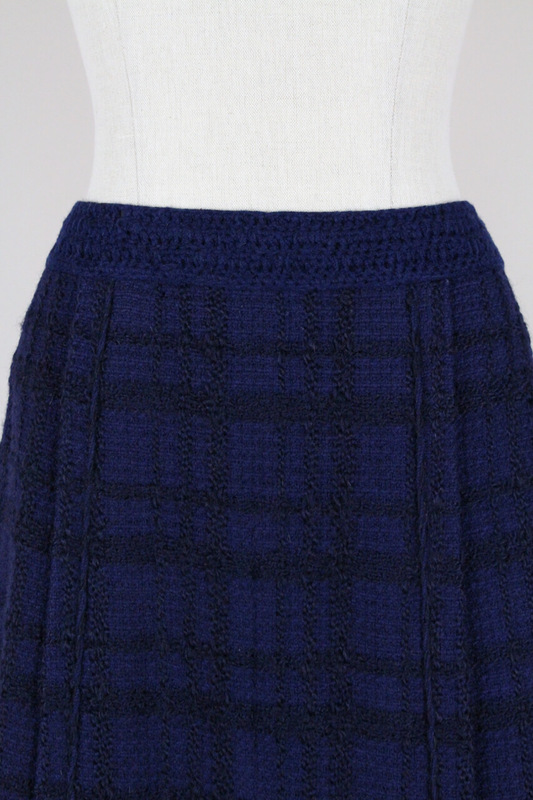 The matching skirt is just below the knee, has a simple, straight cut with a center back vent and no waistband. 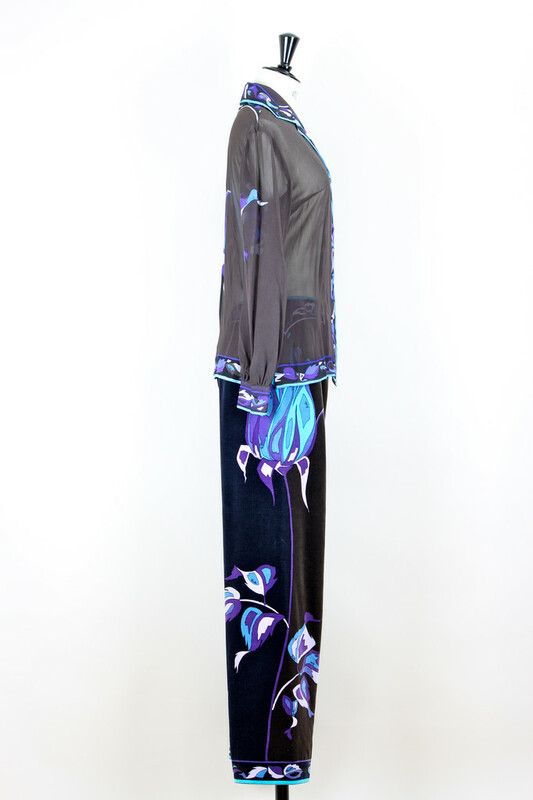 It closes in the center back with a hidden painted metal zip and an inner button at waist. 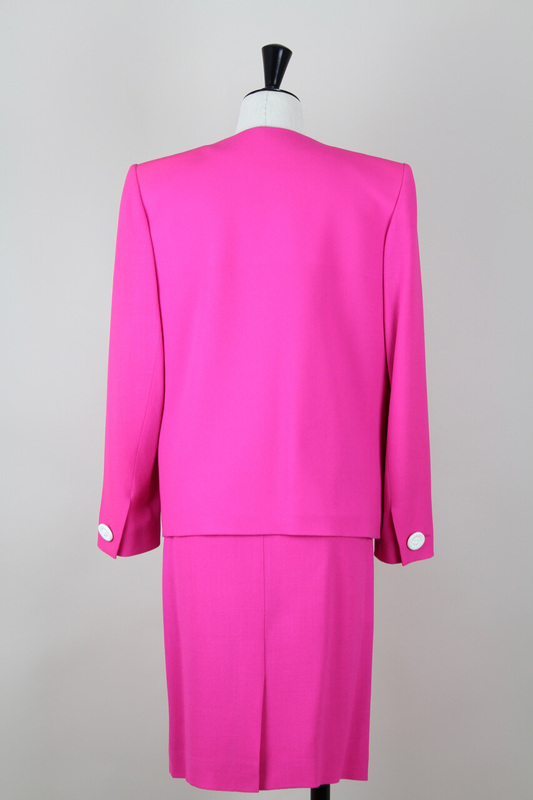 PLEASE NOTE: This suit is from Marc Bohan's last collection for the house of Dior. 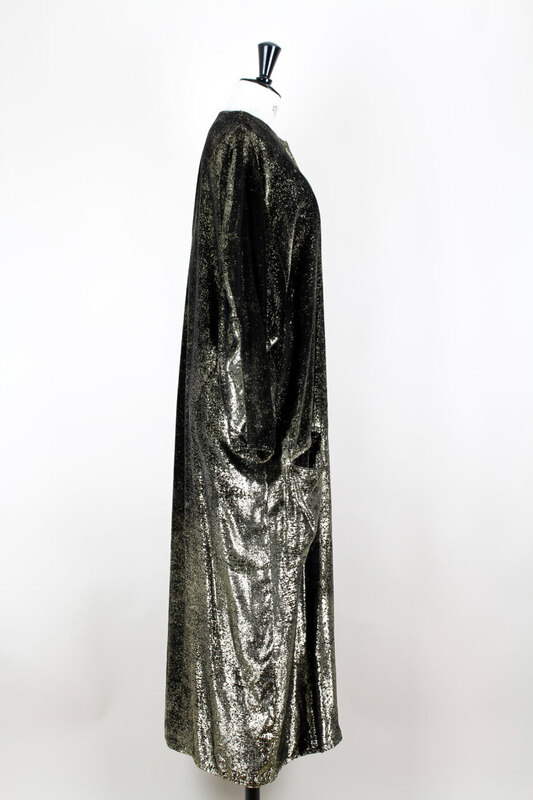 After designing 30 years for the French couture house he was replaced by Gianfranco Ferré whose first collection was the one for Autumn/Winter 1989. 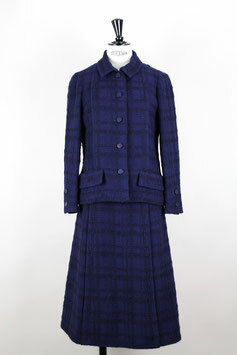 This skirt suit is in excellent vintage condition. 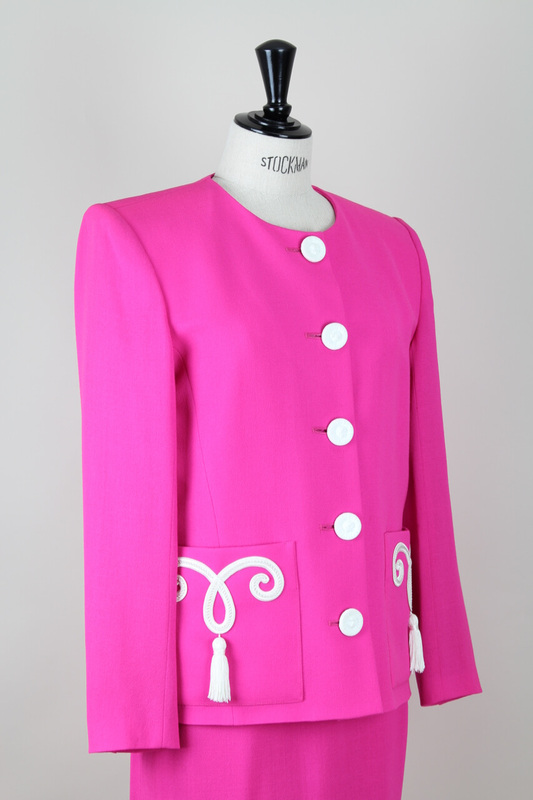 Length: 58 cm – 22.8"
A show stopping hot pink passementerie jacket and skirt suit by Yves Saint Laurent from the late 1980s / early 1990s. 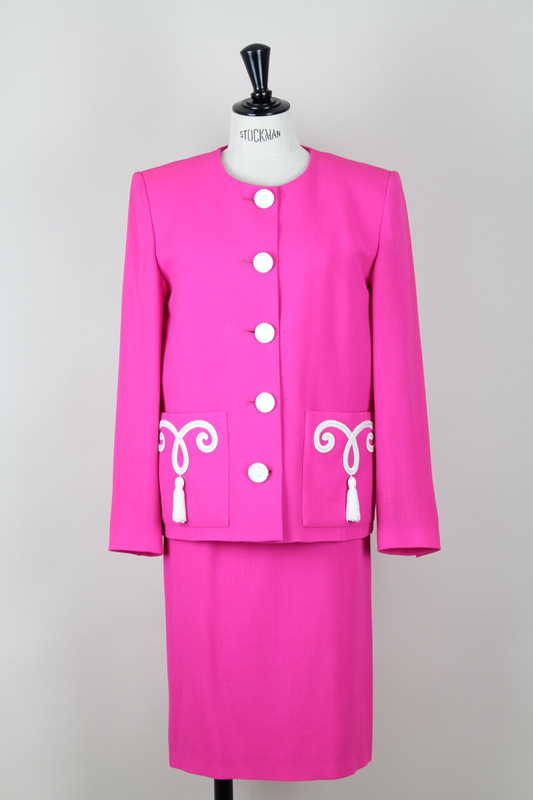 This jacket and skirt suit is made from a lightweight hot pink wool blend crepe. 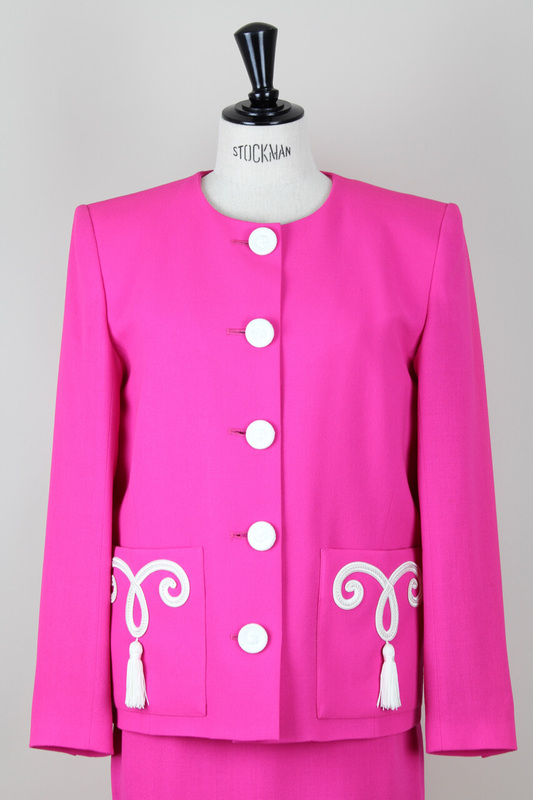 The collarless jacket has a box cut with shoulder pads, long sleeves with buttoned cuffs and two lower front lined patch pockets with an eye-catching white passementerie style decoration and tassels. 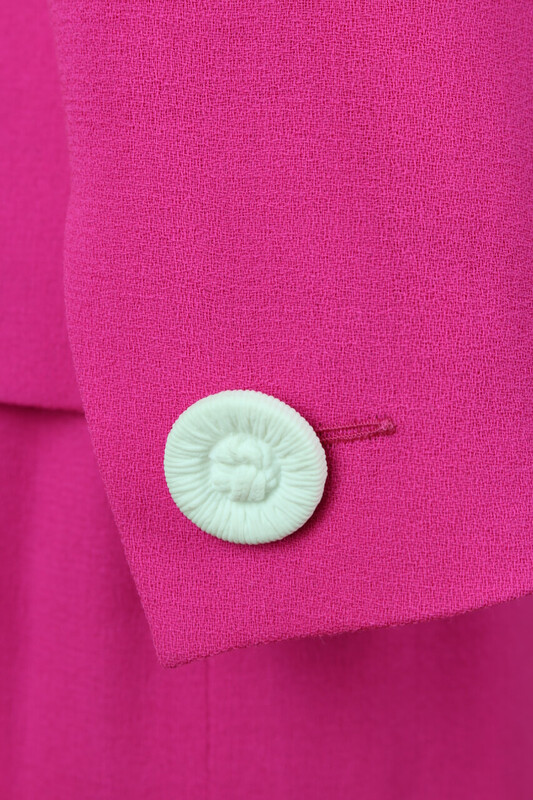 It buttons up the center front with beautiful white decorative buttons and is fully lined in pink silky rayon. 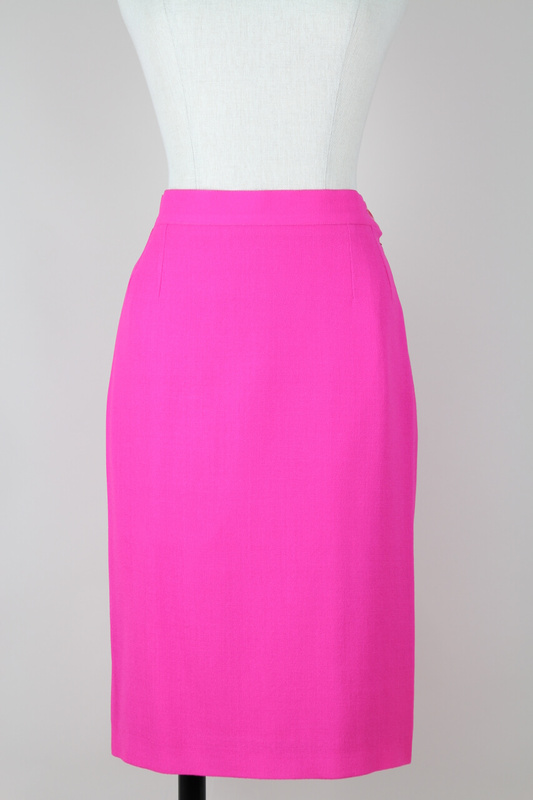 The matching high-waisted pencil skirt is just above the knee, has a waistband, a back vent and is lined in pink silky rayon as well. 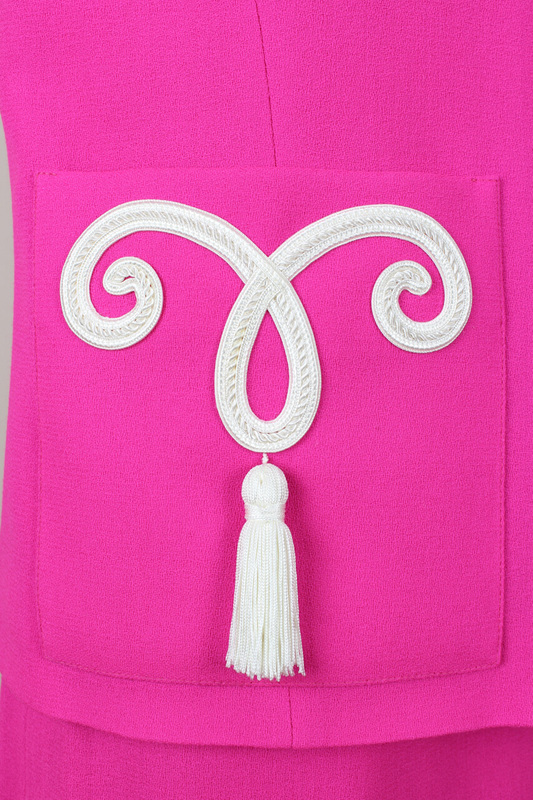 It closes on the left side with a hidden painted metal zip and a pink button. 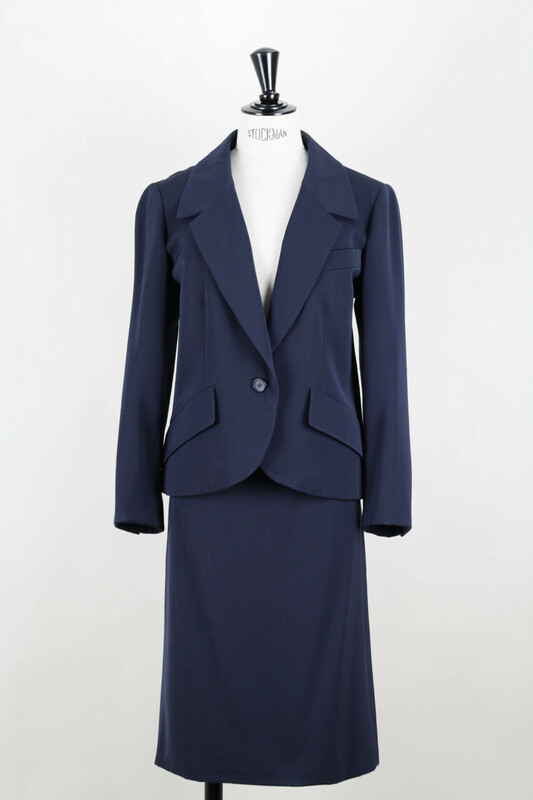 This skirt suit is in excellent vintage condition. Seems unworn. 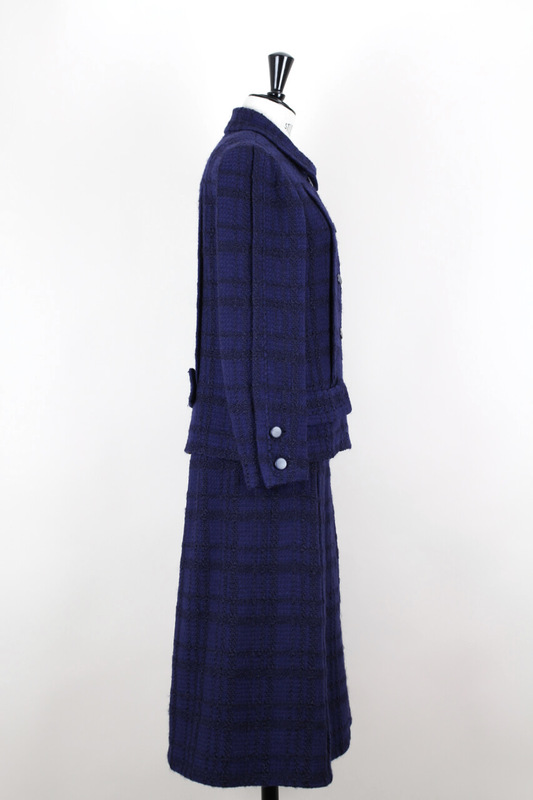 Bust: 101 cm – 39.8"
Waist: 95 cm – 37.4"
Length: 63 cm – 24.8"
Waist: 73 cm – 28.7"
Length: 61 cm – 24"
An absolutely stunning numbered Chanel Haute Couture jacket and skirt suit from Autumn/Winter 1971. This Chanel jacket and skirt suit is made from a soft black checked purplish blue bouclé wool. 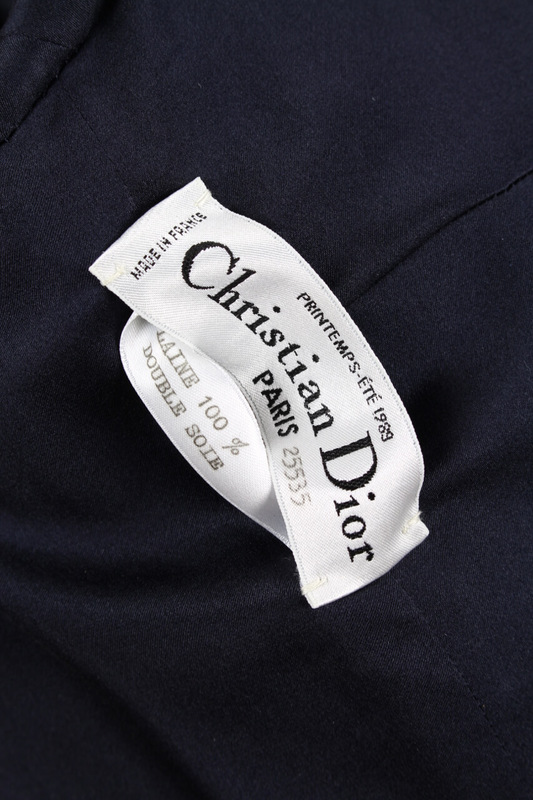 It is finished to Haute Couture standards and entirely done by hand. 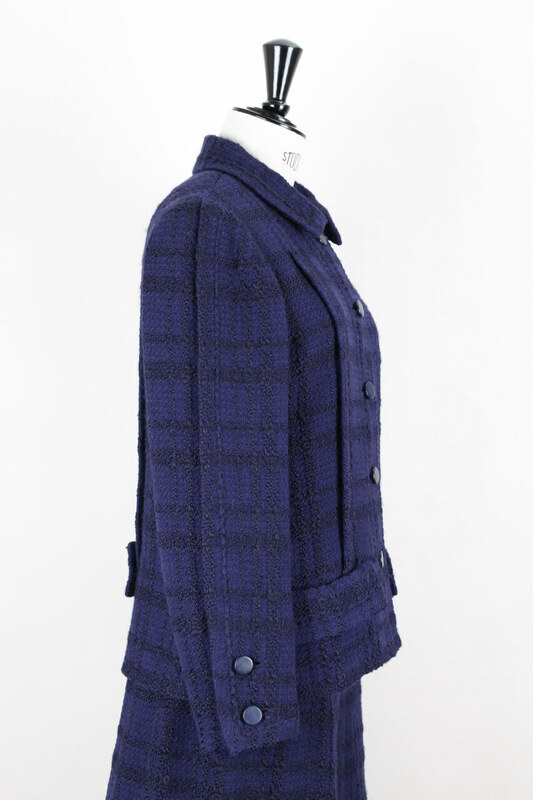 The jacket has the classic, timeless box cut with the unique multi-panel construction Chanel is famous for, a pointed silk backed collar, bracelet length sleeves with a two button cuff, two lower front silk lined flap-style pockets and a half back belt. 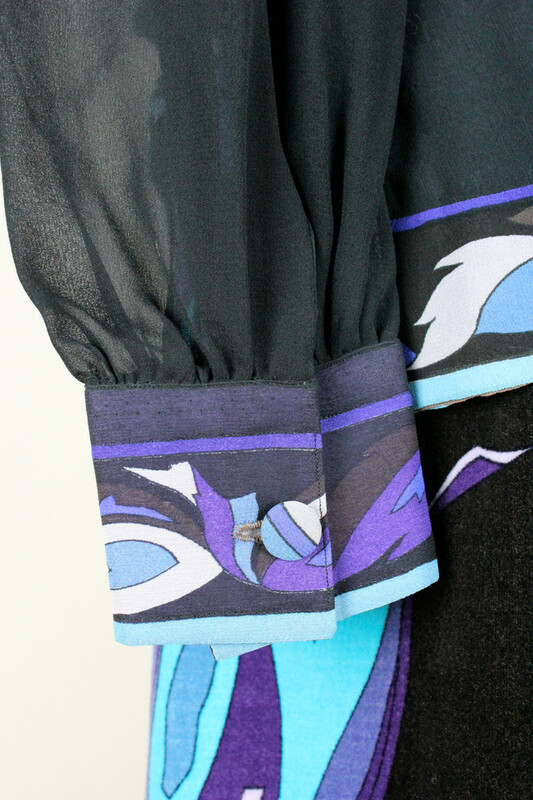 It buttons up the center front and is fully lined in matching blue silk that is stitiched in long vertical panels. 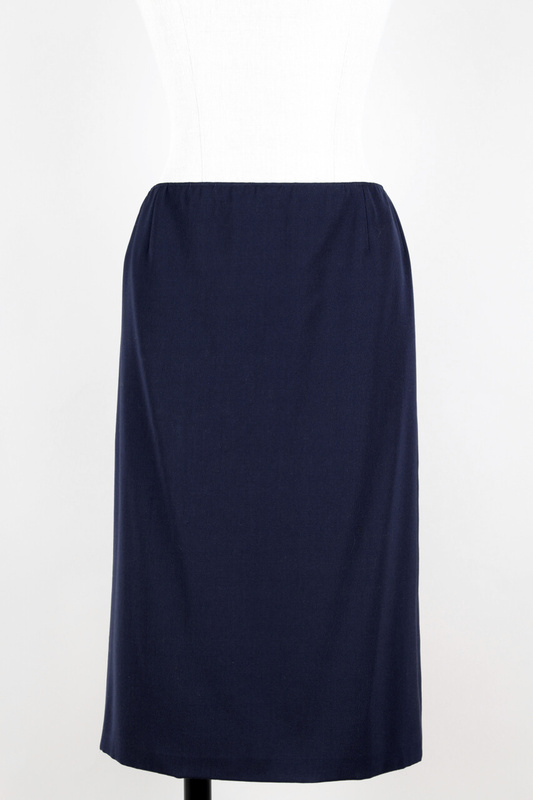 The signature heavy gold chain runs along the inner hem for perfect drape. 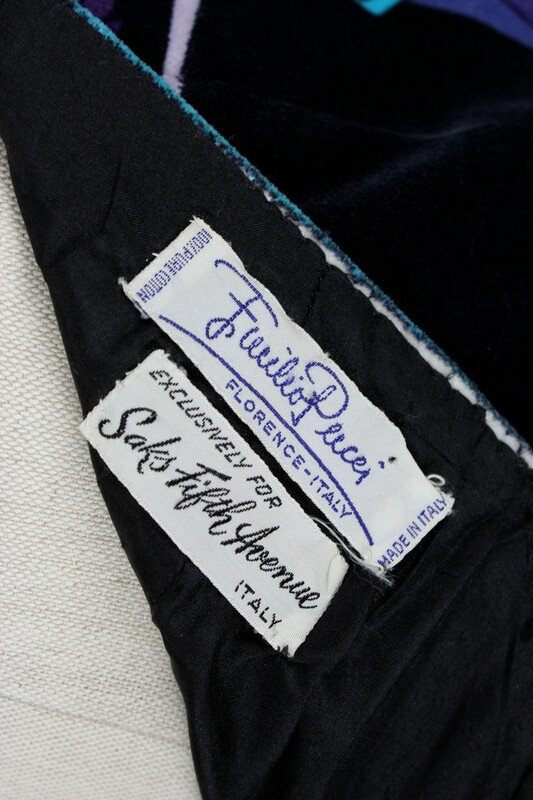 The original large black and white label has the registered couture number 42883. 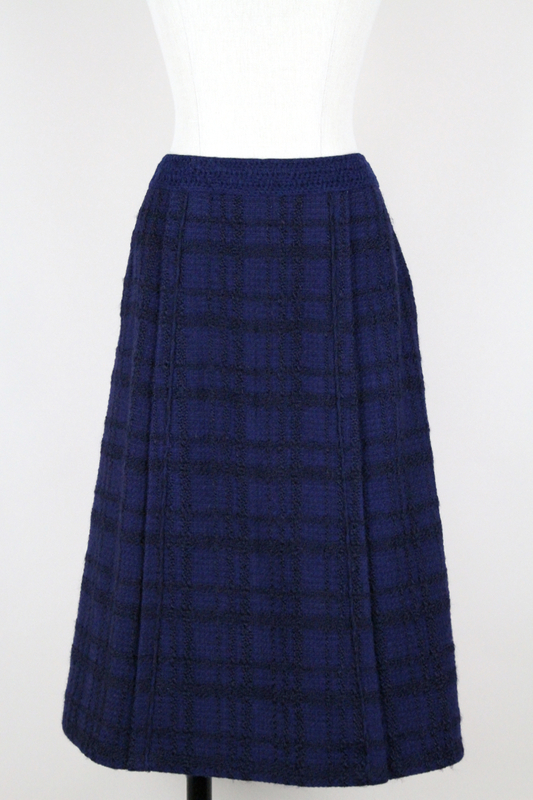 The matching skirt is just below the knee with a slight flared cut, has a knitted waistband and is lined in matching blue silk as well. 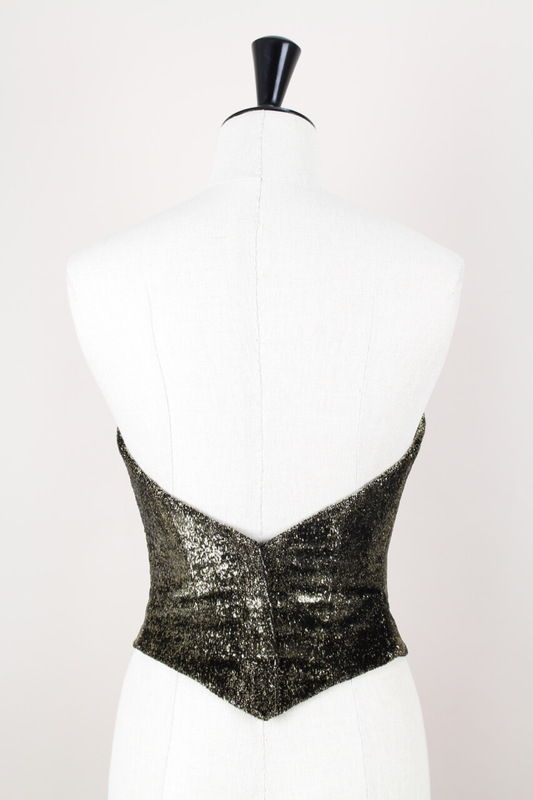 It closes in the back with a hidden hand set painted metal zip, a flat metal hook and eye at the waist and a tiny silk covered press button. 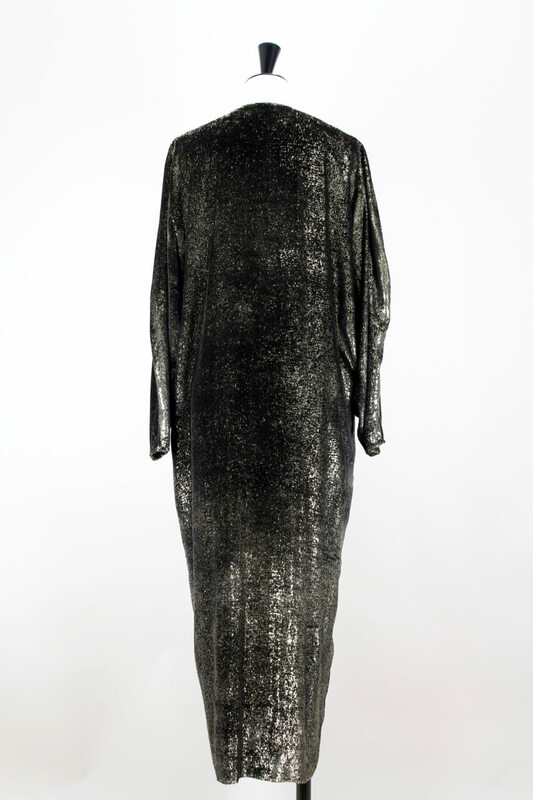 Coco (Gabrielle) Chanel (1883-1971) is famous for her timeless designs that are still popular today. She opened her first shop selling hats in Paris in 1910. In the 1920s she launched her first perfume, Chanel No. 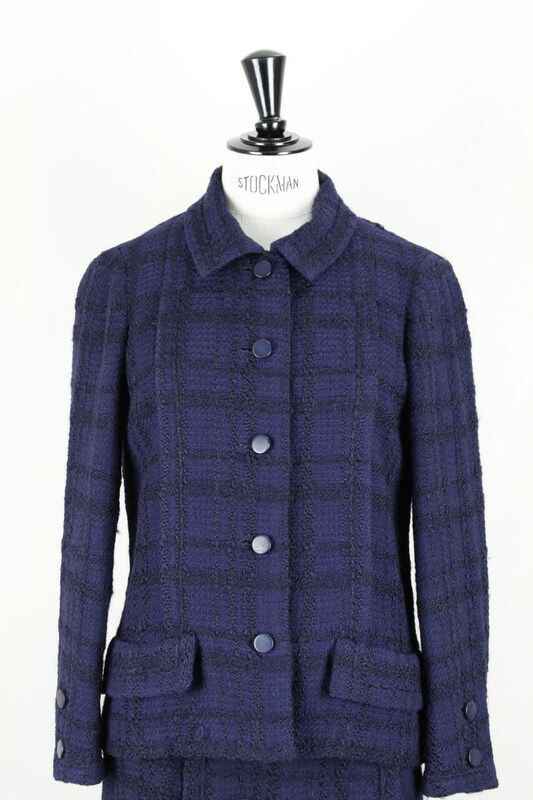 5, and later in this decade the now legendary Chanel suits with boxy jackets and well-fitted skirts in pretty wools, tweeds and silks and the little black dress. 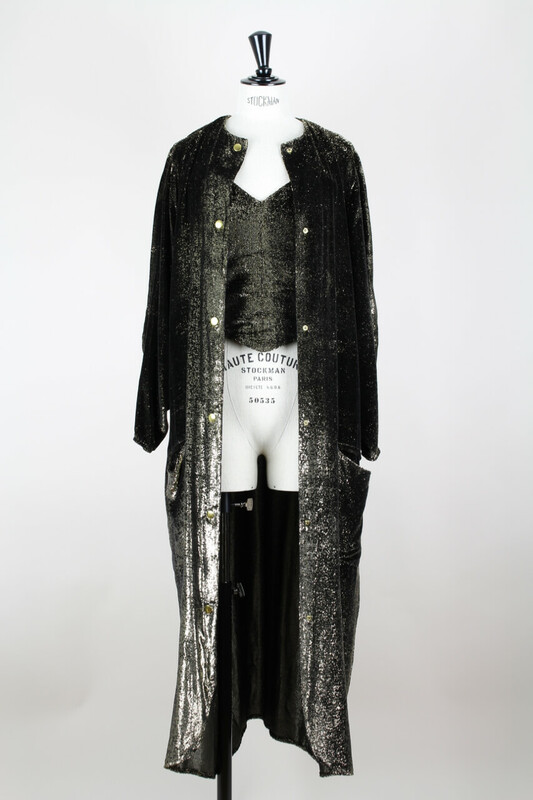 A little more than a decade after her death, Karl Lagerfeld became her successor as head designer in 1983. 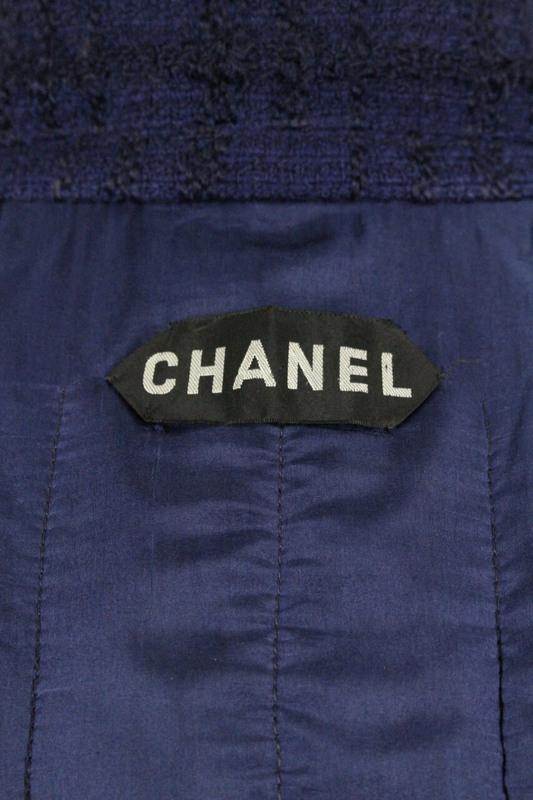 Since then he continues the Chanel legacy. This skirt suit is in excellent to mint vintage condition. 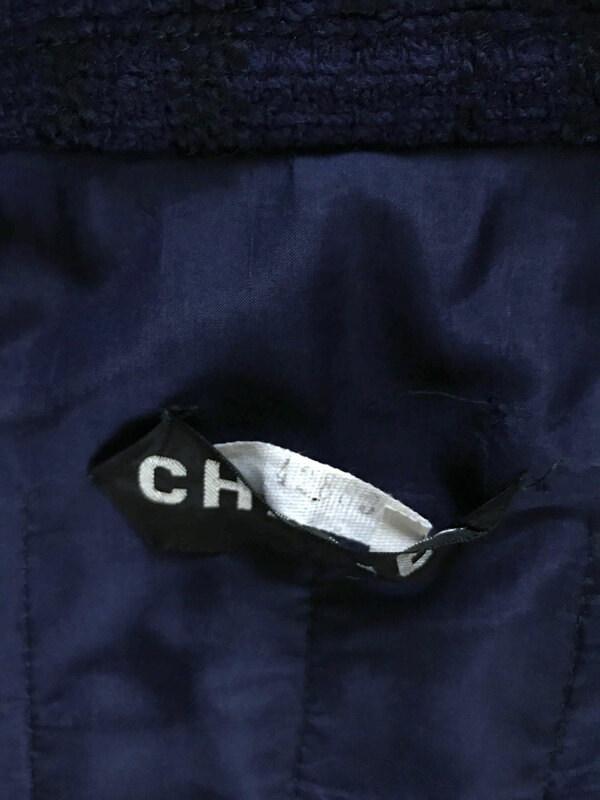 It seems unworn. 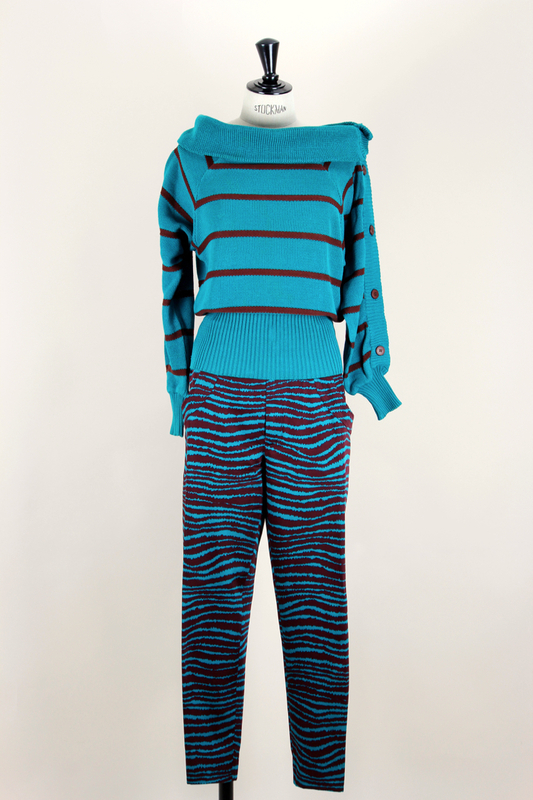 Length: 59 cm – 23.2"
Waist: 74 cm – 29.1"
Smart unusual Yves Saint Laurent rive gauche jumper and trousers set from the 1980s. 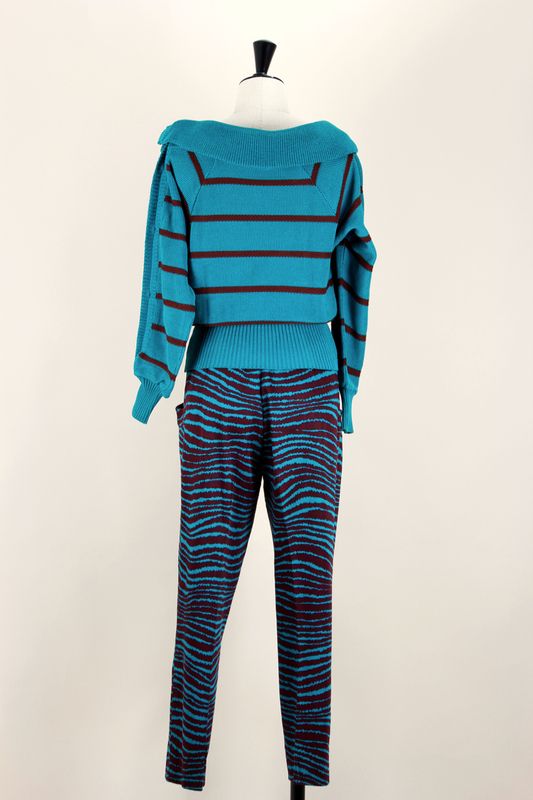 This two-piece set consists of a teal green and maroon striped knitted jumper and high-waisted colour-coordinated zebra stripe-esque patterned trousers. 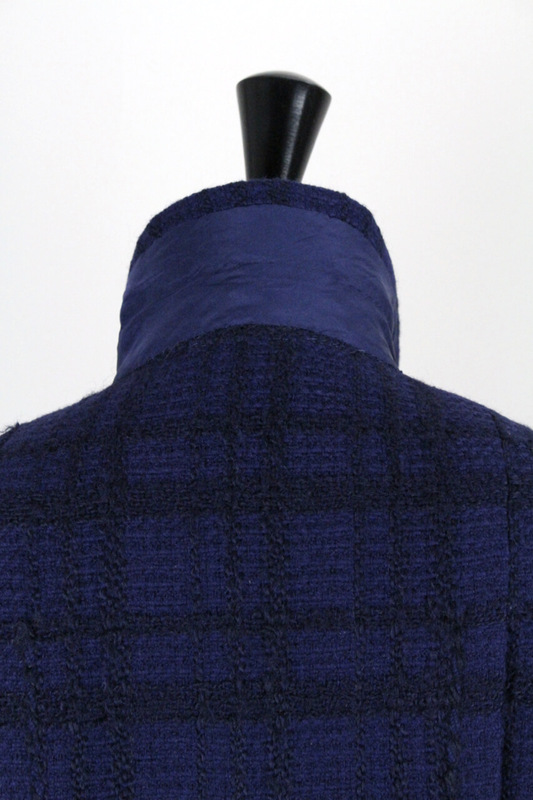 The pullover is made from high quality cotton, tagged "Fil d'Ecosse“, and features an oversized collar, long sleeves (buttoned the left one) with fitted wide cuffs and a fitted wide waistband. 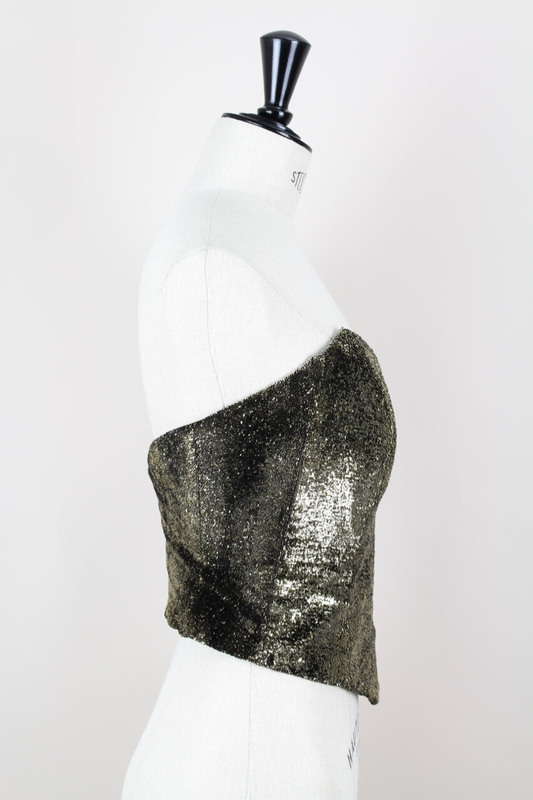 It can be worn on and off-the-shoulder. The colour-coordinated corresponding trousers are made from cotton. 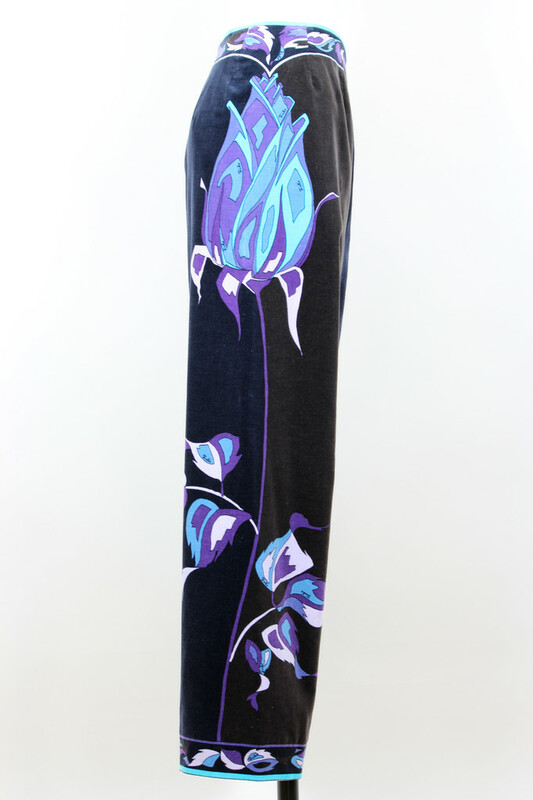 They feature a flat style front, a narrow waistband, no belt loops, a hidden front zipper and metal slide clasp closure and two slightly exaggerated side pockets. 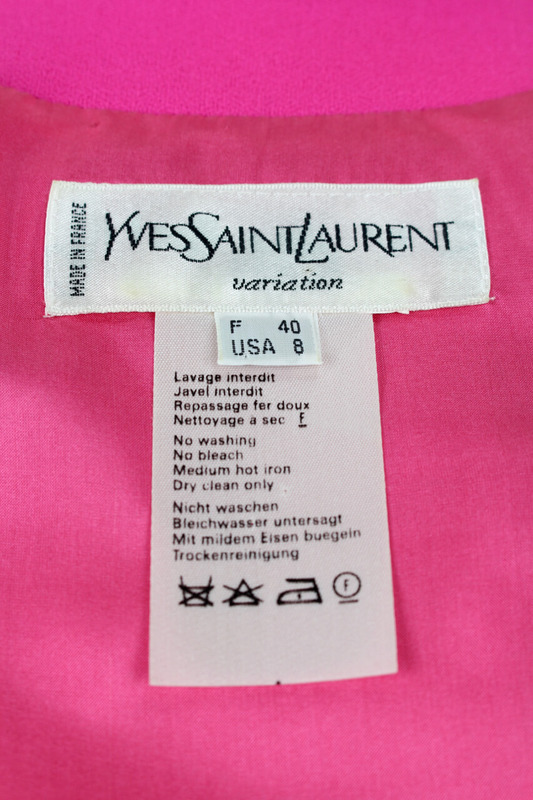 The set is unlined and has the added provenance of coming directly from a lady that worked for the YSL shop in Munich so has not been on the market prior to this. 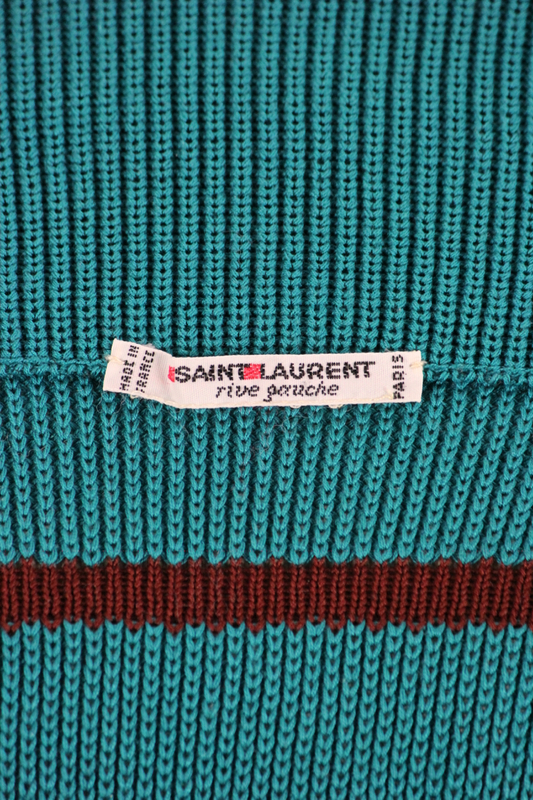 The jumper is labeled "Saint Laurent rive gauche" and tagged a French size 36 whilst the trouser's label has been removed. 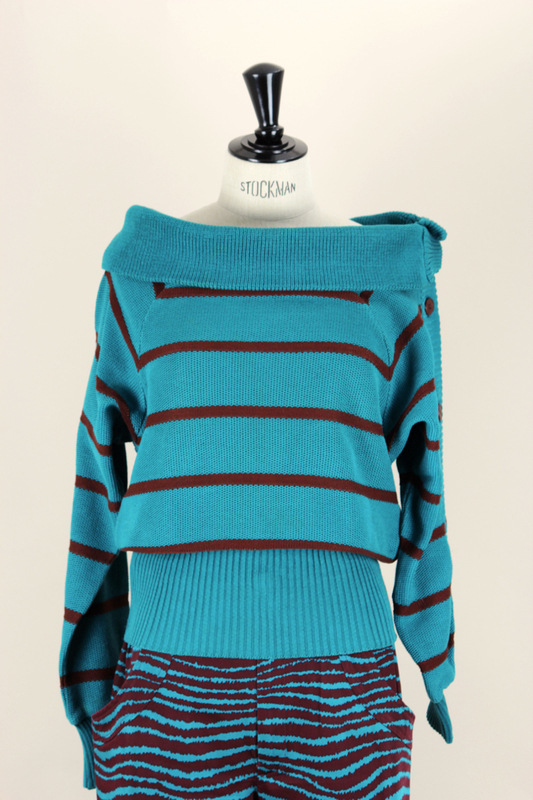 Both items can also be worn perfectly separate. 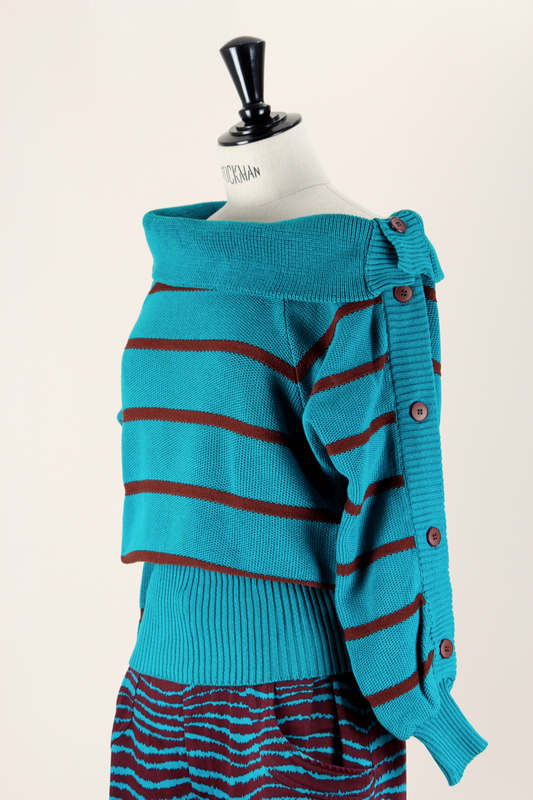 Please note that the teal colour in person is a touch more green in feel with a drop less of a turquoise to it. 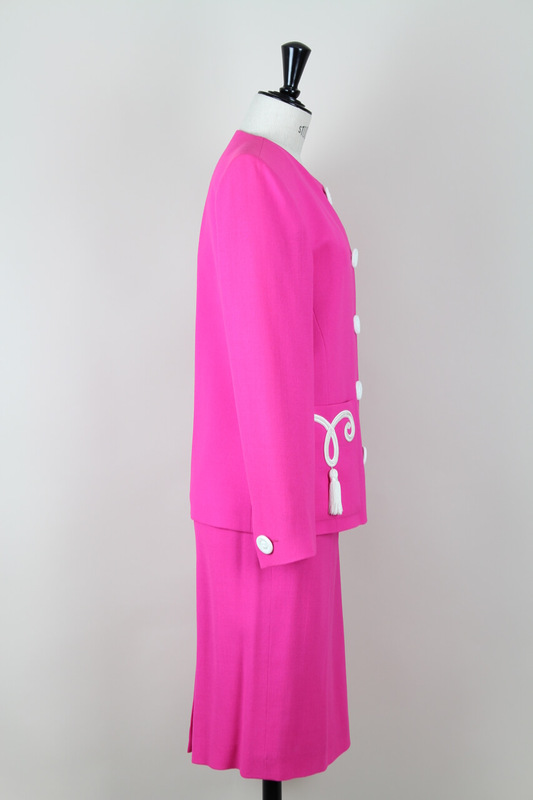 This two-piece set is in excellent vintage condition. Length: 93 cm – 36.6"
Exceptional 1960s set with blouse and matching palazzo trousers by Emilio Pucci. 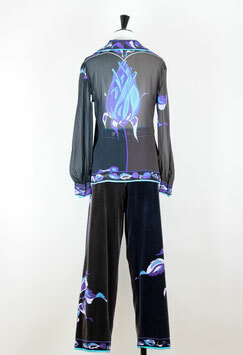 This blouse and trousers set features a floral design in turquoise, purple, blue shades and white. 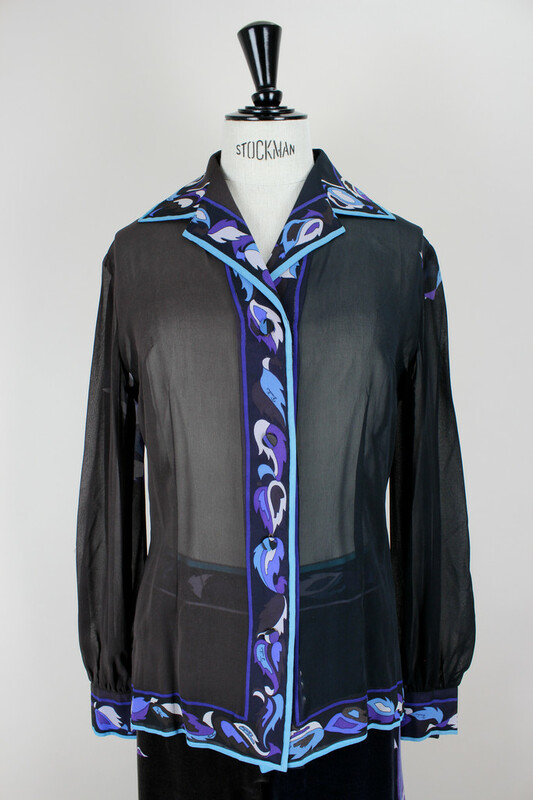 The sheer silk chiffon blouse shows a V-neckline with collar, a front fabric button fastening, side slits and long sleeves with cuffs. 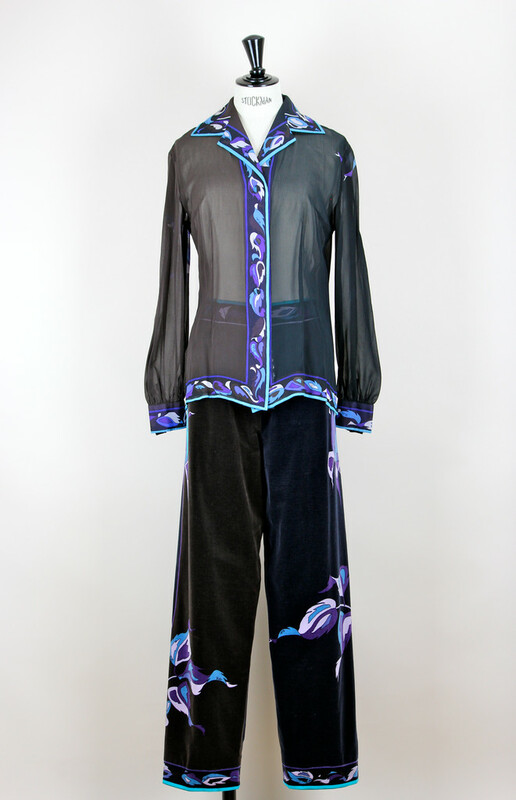 Half of the blouse is done in darkbrown chiffon, the other half in black chiffon. 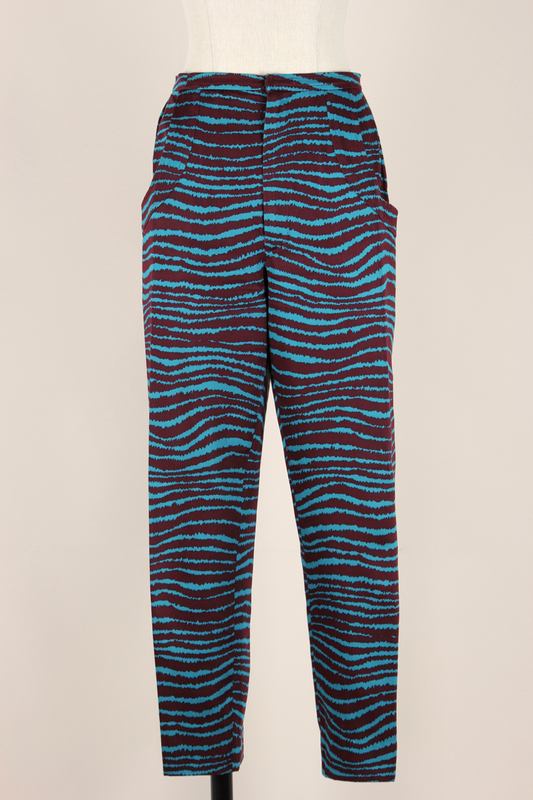 The trousers' legs are a reverse of colours. 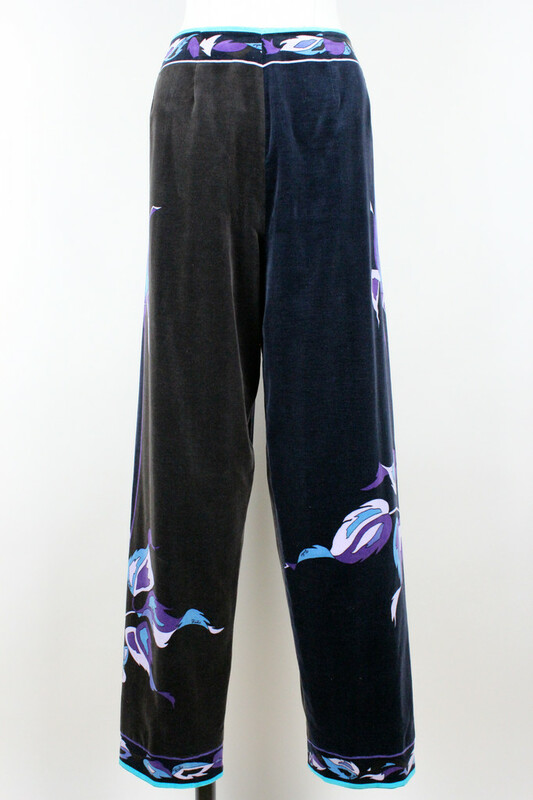 The wide leg trousers are made from cotton velvet, are fully lined and fasten up the back with a 19 cm - 7.5" concealed zip and a hook and eye. Both items are signed "Emilio" throughout. This two-piece set is in excellent vintage condition. 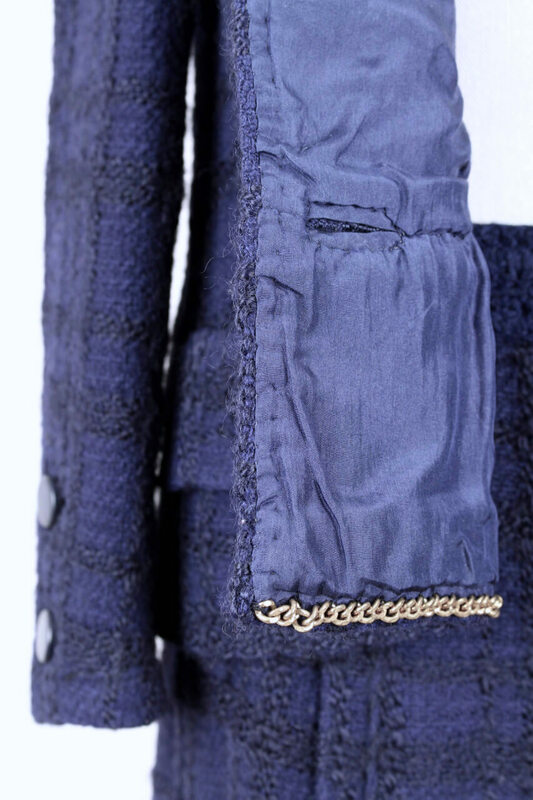 The trousers were eased in the back beside the zipper (see picture 9). 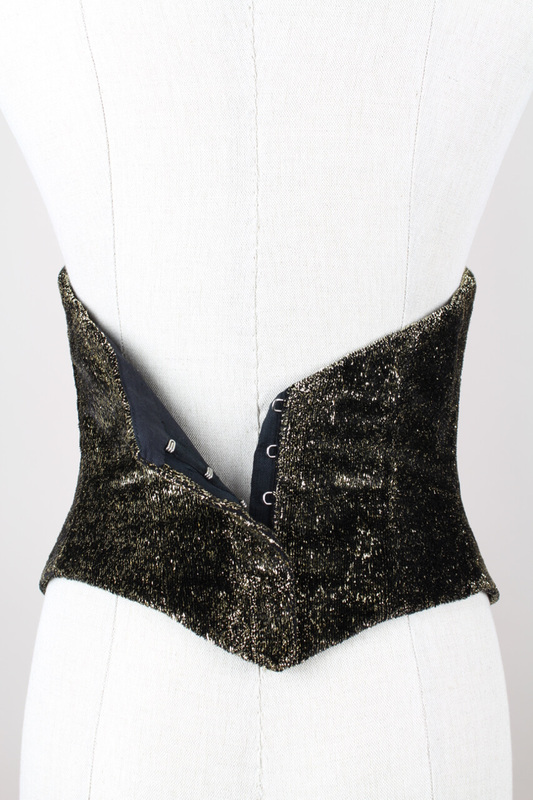 Can be redone by a seamstress easily. 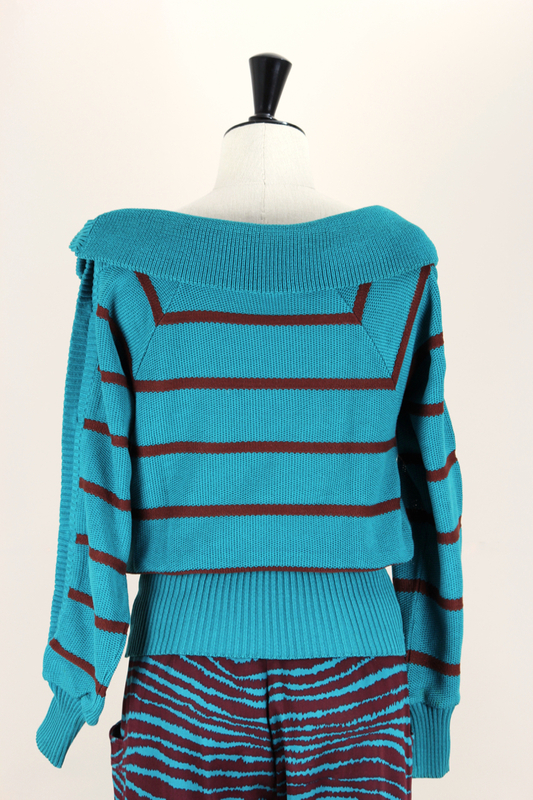 Shoulders: 42,5 cm - 16.7"
Waist: 85 cm - 33.5"
Length: 62 cm - 24.4"
Waist: 79 cm - 31.1"
Hips: 106 cm - 41.7"
Length: 102 cm - 40.2"